Set Of 12 Stock Dura Snap Upholstery Buttons In Black Vinyl. 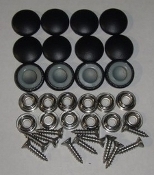 Available In Sizes #30 And #36, Buttons Include Mounting Screws And Stainless Steel Studs. Choice Of Standard 3/4" Long Screws Or Extra Long 1 1/2" Screws. All Vinyls Used Are Designed For Marine Use So They Can Be Used On Boats As Well As All Interior Upholstery Projects. All Stock Buttons Are Normally Shipped In 1 Business Day From Time Of Order Via US Mail And Shipping Is Free On All Button Orders.